I have a Macbook Pro Retina 13" (Early 2015) and I have a bootcamp partition with Windows 10 installed in it. Also, there is an Ubuntu Linux on another partition, so it’s a triple boot computer. I’m not using rEFInd, but the stock startup manager instead. I am switching operating systems using the option key at boot and it was all working fine until recently. The problem I am facing right now is that every time I turn my laptop on or try to switch operating systems using the option key the drive selection screen takes a long time to appear, like literally 20 to 30 seconds. This is not really normal because it used to be 2-3 seconds. Also, once the drive selection screen appears the mouse pointer just doesn't work or sometimes work un-reliably or extremely slowly. I can use the arrow keys in the keyboard to select the drives but the response is just too slow. Once i hit an arrow key it takes 15 to 20 seconds to register and move the selection, sometimes it doesn't respond at all. And then finally when I hit return it takes another half a minute or so to load up the boot sequence. After that the operating system works just fine. I also have GRUB on one of the partitions for loading Linux. When I select Linux in the Startup Manager drive selection screen the GRUB console starts and it works very slow as well: I have to type commands and wait 10 seconds for the letters to appear on the screen. Ubuntu itself works just fine. Could anyone please point me out on any possible causes of the problem? I will provide any additional info if you request. There is a very similar question, but it was solved by completely reinstalling everything. However I would like to find the real cause of the problem to be able to prevent it in future (my setup is kinda complex, and I don’t want to reinstall everything just to face this problem again in a month or two). Update 1: I have tried to reset NVRAM and SMC with no result. It's possible that the issue happened after the system update, but it definitely happened long before the major update from El Capitan to Sierra. The issue takes place not only in Startup Manager, but in any software that is running before the OS starts booting. Recovery, Hardware Diagnostics, Startup Manager, and even GRUB (which is on it's own partition) all work extremely laggy. If I don't hold any keys and let the macOS boot normally, then everything that occurs before the apple logo is taking much more time than it should. As soon the logo and progress bar appear - the lags are gone. Same with other OSes. I've noticed that when I bought the laptop this test passed without any issues. I also tried to boot in Safe Mode, but nothing happened, except that the macOS GUI was glitchy and choppy while in safe mode. The subsequent boot goes without slugging, seems like the issue is gone, no matter which OS I choose this time. But the issue is back at the next boot. Also, if I choose to "Shut down" at the step 2, the subsequent boot is slugging like every other. What could be so special in Ubuntu live stick, that it cures the issue for one time? Same issue here, noticed it in FileVault, but then realized it is there even on Boot selection section or even Diagnosis section. Disabling FileVault won't solve the issue, it will just cover it up. I wasted a lot of time with software sides of things, reinstalling OS and all. they all didn't help. It is a Hardware issue. I realized I have this issue once I started using SD Card reader for storing my files and extending my 128gb MBP. If SD Cards goes in, even for 1 second, and then take it out, boot is going to be slow until I do a NVRAM reset. Apple care didn't find any issue first time but second time they admit there is a hardware issue in my Macbook and they replaced it. I will report back issue returned. You need to bring it to Apple care, and describe the issue in detail. I had to print a A4 paper with a detailed description (told them issue happen when put in a sd card and then take it out) and screenshot of diagnosis page showing SD Card error in diagnosis boot page (because for some reasons, it was randomly showing that error and apparently when I give my Macbook for first repair, it passed test 100% successfully) Reception who receive my Macbook, she didn't really reflect things I told to her to technician. She even typed issue of my macbook as "Booth up slow", you get the idea. Yeah, you need to bring it to apple care for hardware fix and bring enough documents to prove them it is hardware issue. fsck -fy / and see if there are any errors. After the run type reboot if there were any changes or exit if nothing needed repairs. paste the output somewhere please so I can take a look on it. Reboot after that and see if the behaviour changes- might also help. until it cries that there are no entries anymore. Don't worry about it, those variables are set to default each time if they are not set by your macbooks firmware - and that's what we want, we can see if the default boot device is having scanning issues or scanning issues are created by obsolete entries. Let me know when you do this - in most cases you will be done at this point, if you won't - let me know here and we can look into it further. I strongly recommend to use refind as bootmgr, its not native, but it does not look for Timemachine and does not calls home through wifi ;) also it gives you better options in case of troubles and you can still can use the native apple's EFI boot, refind does not care about it - its just a change in your boot order list so refind is on it. It also loads some .efi drivers for extra access and functionality at boot time, so far I know they don't collide with apple firmware. Troubleshooting is often a process of elimination, so it can take time and patience. We'll have to work through these steps one at a time until we can identify the cause and resolve it. As a starting point, I would update macOS Sierra to 10.12.2 (it's been out for about two weeks now). I'd also ensure you have the latest version of Paragon NTFS for Mac OS X and FUSE for macOS installed. Once you've ensured you have the latest versions installed, let us know how you go. This problem depends on a firmware issue that prevents the I/O board from working properly. I suggest to upgrade to MacOS Sierra 10.12.4, which contains a firmware update that address this issue. Based on the information provided in the updates and the comments, there appears to be a problem with the SSD; either a physical problem or a problem with the partition table. Especially since the "problem went away" when you booted Linux. When you turn on your Mac, it loads the EFI from ROM. Basically, long before any software or addins like FUSE or MacDrive or Paragon can be loaded, it's loading up drivers to read the hard drive. Note: It only knows how to read HFS+ and MBR; it has no clue how to read NTFS. If/when you press Option during boot, it brings up a GUI boot manager. It will scan the available volumes for a header that tells it what type of boot partition is available. This is the list you get to choose from. If you notice, before it boots the volume, it writes the boot volume info to NVRAM. This is why it worked after your Linux boot; it had clean volume info. 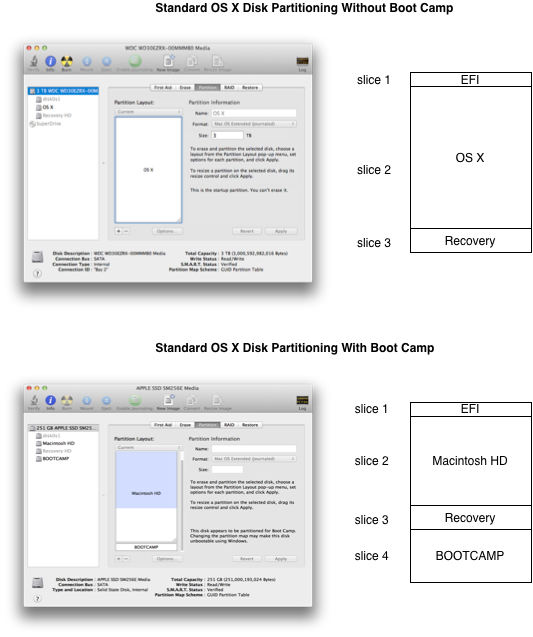 Also if you are running Boot Camp, you aren't booting directly to to the NTFS partition directly, you are using a boot loader (Boot Camp) to boot Windows. If you have multiple OSes like macOS, Linux, and Windows, you are probably using a different boot loader like GRUB. Now, if you were to issue the command diskutil list you would see that it only displays a GPT header for Boot Camp, not the actual NTFS Boot Camp partition itself. 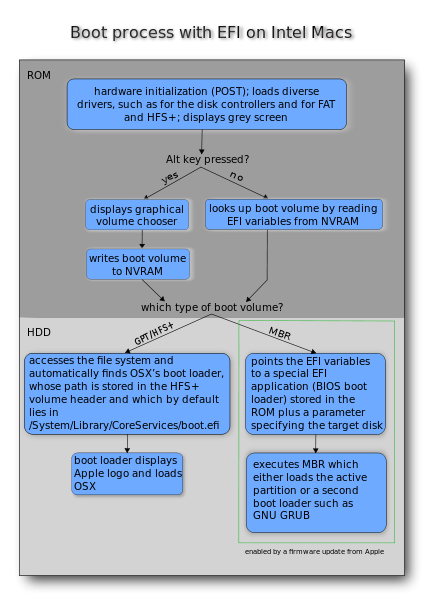 EFI can't boot NTFS; only HFS and MBR - this is why we need the boot loader. For this procedure, you are going to need another bootable medium like an external USB drive or a USB flash (like your Linux USB, but macOS). The way you diagnose if your SSD is the problem is to remove the SSD. It's a fairly simple process of removing the back cover and removing the module. 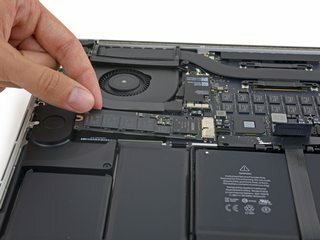 iFixit.com has an excellent guide on how to do this. For this procedure, you are going to want to make sure you have a full backup of your drive. Once you are sure your SSD is backed up, wipe your SSD and do a clean installation of macOS. The the problem persists, your SSD is most likely faulty. If not, then it's most likely there was a corrupt GPT table. Do a full, clean install of both macOS and Boot Camp. Then do a restore your data from Time Machine (backup). Once you have determined whether it's your drive's partition table or a physical problem, you can proceed from there. I understand that the issue could hapeen with update process, Paragon NTFS or some boot error, but I had similar experience on early 2015 MacBook Pro fixed up by disabling full disk encryption in recovery. After re-enabling it everything worked well. I recommend fixing disk permissions in recovery, too. A simple test - can you boot from SD Card? Just install a small OS on it, and, after pressing option, select the SD Card. If your Macbook has an IR receiver, make sure to cover it with some black tape, sometimes these things break and give constant signals which result in the behaviour you describe. I have the same issue. Refit takes forever to load. I have also tried the regular reset SMC, PRAM, etc. I am triple booting my system with archlinux and windows 10. A few other people have this problem with the early 2015 macbook pro as well. Which SSD do you have? I have the 512 Gb version. I really dont want to start over again and reinstall everything. There is simple way to verify if you have the Bad SD-I/O Card problem. Just hold down the D Key on power up and it will run diagnostics. I brought mine to the Apple Store and that is the first thing they did and the SD Card popped up with an error. Even though my SD Card worked fine. They installed it the same day (after waiting 1 day for the part to arrive). There are places on the net you can buy the part new or used and replace yourself. I'm fairly technical and done repairs like this but I decided to pass on this one. Involves removing CPU Heatsink and fan and quite a few small connectors. You can see Videos on Youtube for similar repair on MacBook Air. iFixit has detailed description on repair for this exact laptop. some 2015 macbook pro owner reporting the slow/unresponding issue has gone after update to the newest macos 10.12.4beta8. It is clearly a driver issue and apple has finally addressing that on their latest update. I had the same issue and it's finally gone after the update to 10.12.4. Not the answer you're looking for? Browse other questions tagged bootcamp boot startup efi .